Glo 0.0k unlimited free browsing cheat is blazing back, but with a different proxy server. Sky VPN Settings For Glo Free Browsing Cheat Novermember 2018 . Glo Free Browsing Cheat 2018 is now browsing via Sky VPN app which works for both Android and PC users without any special settings or proxy servers. 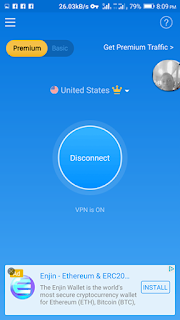 The VPN app is pre-configured with all the necessary settings and IPs that will let Glo, MTN, Airtel, 9Mobile or any other network to establish connection without stress. But but some users lamented that the Glo cheat usually disconnects at intervals making it frustrating to use but with the help of Sky VPN app, there is nothing like Disconnection issues or errors. SkyVPN offers security to your online identity by making you appear anonymous, hide your IP and Unblock any website or app in the world for you to have access to. 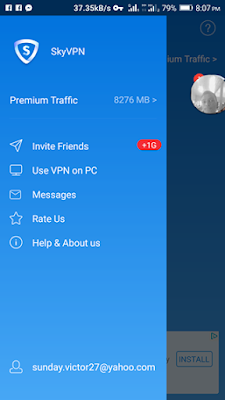 Aslo, enjoy free internet data on Sky VPN when you complete certain tasks like inviting friends to download the app and enjoy free 1GB data, daily sign in data bonuses and “I’m feeling lucky” data splash. The downside is that it is limited to some data usage (i.e you will have to be a premium user before you can have unlimited usage). Now, go back to the app main page, and tap on Premium button, a pop up message will ask if you want to upgrade, click on Upgrade and choose United States as your region. If you follow these steps properly then you should see that the Premium text will turn yellow in color. For you to get more free data on sky vpn, you need to generate your own unique referral link by tapping on the app menu and clicking “invite friends”. You can share your link on whatsapp, Telegram, Facebook, Twitter etc. The more people downloads from ur link, the more you get free 1024MB (equivalent of 1GB). If this post Sky VPN Settings For Glo Unlimited Browsing Cheat Sky VPN Settings really helped you, please leave a comment below and share this post with friends online.